The Buildoffsite briefing is a regular newletter covering recent activities of buildoffsite, its members and the offsite industry in general. Bridges and Viaducts DfMA Guide. A new DfMA guide outlining the benefits of combining Design for Manufacture and Offsite Construction in the context of long-term, large-scale bridge and viaduct projects. The Building Engineering Services Association, in partnership with Buildoffsite, has produced an updated ‘Offsite Guide for the Building and Engineering Services Sector’. To down load your copy please click here. Ela8 in association with Buildoffsite have produced a useful guide to the intricacies of tax relief for R & D.
FRIDAY 8th SEPTEMBER NEWSLETTER DEADLINE KLAXON!! Have you contributed to our Bumper Autumn Edition of BOS Newsletter? An update of Buildoffsite activity in 2016-17, overview of our sector specific Hubs, a variety of case studies from members and our member directory. This review is intended to provoke debate as to the current and likely future state of the industry and identifies the urgent actions needed to lead a change agenda that will safeguard the industry’s future. Offsite construction is a general term for making parts of a building away from the construction site before transporting them and installing them in their final location. In the building services sector, installing various mechanical and electrical systems on a live construction site can be challenging, with limited space, health and safety considerations, working around other contractors, and often all to a demanding programme. This topic guide describes the forms that offsite construction of building services can take, and discusses some of the surrounding issues. The Mayor of London’s draft London Housing Strategy published on 6th September 2017. Register by 20th September to attend the October Workshops at City Hall. Further information is available on the City Hall website. ” This report sets out how a once immature offsite housing market has matured and come of age. The speed of this sector’s maturity should act as a clear indicator and at the same time a warning to the Mayor and indeed all those involved in offsite housing provision, that engagement and action is required now, not tomorrow, if it is our intention (as a minimum) to maintain or increase current housing supply. What is different about the London Assembly’s paper though is that whilst OSM is a key driver in increasing housing supply, and a must if we are to meet the levels highlighted in the report, they have recognised that this can’t be achieved without a coordinated and efficient supply chain. The London Assembly’s paper on OSM completes a trilogy of papers on the subject which includes the Offsite Housing Review produced in 2013, the Farmer Review produced in 2016 and now this GLA review titled Designed, Sealed and Delivered. Further Information is available on the GLA Website. Here we have some examples of exemplar off site housing and construction in London. All images are available for use. The Offsite Construction Show is now in its third year. With the knowledge transfer seminar programme hosted by Buildoffsite, and sponsored by the Department for Business, Energy and Industrial Strategy (BEIS), showcasing what’s at the cutting edge of the offsite sector and facilitating discussion between key players who are changing the UK construction market to increase quality and productivity. Register here https://offsiteconstructionshow.co.uk/ for 11 & 12 October @ Excel, London. KPMG has compiled a compelling report on how offsite manufacturing can transform the construction industry. Many construction projects have a reputation for being completed behind schedule and over budget. While these companies have tried to improve project time, cost and quality by using technological and commercial industry innovations such as Building Information Modelling (BIM) and collaborative supplier engagement models. But they have largely failed to reverse the trend of poor productivity and project uncertainty or counter the growing challenge of industry skills shortages. 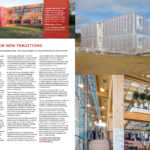 Offsite construction offers an alternative to this current construction status-quo by promising transformative improvements across the asset lifecycle in time, cost, quality and health and safety. But most importantly, offsite construction offers predictability. I am grateful to my colleague Joshua Southern for his research and authorship of this report, which evidences the value of that predictability to the construction industry. We call on construction industry clients to collaborate with suppliers across whole portfolios of construction projects, to invest in and then unlock the value of offsite construction. The NHBC Foundation report Modern methods of construction: views from the industry surveys 135 house builders and housing associations and explores attitudes towards MMC. The research captures the degree to which different methods and systems have been adopted and assesses the appetite for more extensive application of specific approaches. The Ministry of Justice (MOJ) have been implementing collaborative forms of procurement and early contractor engagement (ECI) for over ten years. More recently we have introduced Building Information Modelling (BIM). We view BIM as an important collaborative tool, that if used in a Lean and Collaborative delivery environment helps release the potential for clients and industry to do something differently which could be the catalyst for radical change. From the MOJ’s position as an Intelligent Client and exponent of lean in construction, it was an obvious move to bring all our learning and experience together to run Cookham Wood as a Cabinet Office best practice project highlighting the benefits of bringing the Construction Strategy Initiatives together (ECI, BIM, Project Bank Accounts, Soft Landings and Lean delivery and benchmarking) and showcase how they can be used in unison, realising significant benefits in reduced cost, predictability and SME engagement. The MOJ have been a champion of the current Construction Strategy and will continue to innovate to play a key role in achieving Peter Handsford, the Chief Construction Advisor, ‘Construction 2025’ vision. Graham Watts OBE, Chief Executive of the Construction Industry Council (CIC) and Professor Nick Whitehouse of Oxford Brookes University, today presented the Housing Minister, Mark Prisk MP, with CIC’s Offsite Housing Review report, at a launch held at the £100m Laing O’Rourke Explore Plant in Steetley, Nottinghamshire, which is leading the way in British off-site manufacturing. The Construction Industry Council was commissioned by the Department for Communities and Local Government (DCLG) and the Department for Business, Innovation and Skills (BIS) to undertake a Review to consider and make recommendations to Industry and to Government on the contribution which the off-site construction sector can make to increase the delivery of more homes and how the increased use of off-site construction can be incentivised in England. 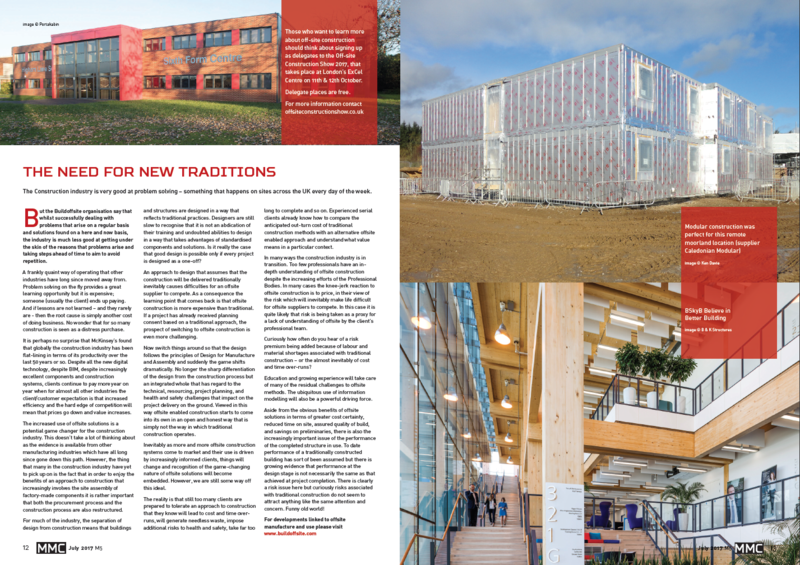 Alistair Gibb, Professor of Construction Engineering Management at Loughborough University, discusses the subject of offsite in a paper. We meet Steve, a senior leader in a construction business as he receives news of yet another failed tender bid. Licking his wounds, and pondering what he can do differently next time, he comes across a comparative review of two projects recently completed by his company. The two schemes were similar. However the second project, significantly outperformed the first. The review reported that the team had achieved this performance through adopting what they described as a Lean Thinking approach. It was worth a look.